Courses I teach regularly at St. Mary’s include: Animal Behavior, Ecology & Evolution, Molecular Evolution, and Tropical Biology. I teach several other courses less regularly. My primary research interests are in animal behavior and evolutionary biology. 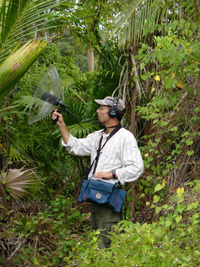 In particular, I’m interested in acoustic communication and the evolution of animal signals. Songbirds provide excellent subjects for these sorts of studies, so much of my previous research has focused on them. My graduate research, under the direction of Haven Wiley, focused on communication and cultural transmission in the Venezuelan stripe-backed wren. This early experience gave me a keen interest in bioacoustics as well as some nasty internal parasites. Later, in my postdoctoral research with Scott Lanyon, I focused on reconstructing the evolution of complex birdsong in a group of tropical New World blackbirds called the oropendolas and caciques. This work let me pursue my interests in behavioral evolution while at the same time mastering some important new skills in molecular biology and comparative phylogenetics. My current research combines detailed observations of animal behavior in the field with analyses in the lab to test hypotheses about the evolution of animal communication. Besides addressing interesting biological questions, this approach provides great opportunities to involve St. Mary’s students in an integrative research program that spans a range of investigative methods, from field biology to molecular techniques. Recent interests include the evolution of female bird song (described here), the evolution of echolocation in birds (described here), the evolution of sexual dichromatism (described here), and the evolution of nest architecture (described here). I like doing other sorts of field work too. I worked for several years on an NSF-funded collaboration with Kevin Omland studying vocal behavior and evolution in the New World orioles. I also teach a summer course at the University of Michigan Biological Station. Duursma, D. E., R. V. Gallagher, J. J. Price, and S. C. Griffith. 2018. 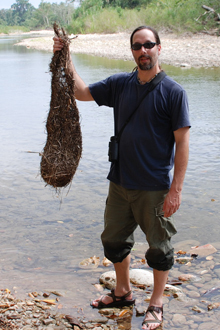 Variation in avian egg shape and nest structure is explained by climatic conditions. Nature: Scientific Reports 8: 4147. Dority, D., J. J. Price, and S. Pruett-Jones. 2016. Yellow-bellied Sapsuckers alter sap well locations in response to experimentally induced tree damage. Wilson Journal of Ornithology 128: 619-623. Sturge, R. J., K. E. Omland, J. J. Price, and B. Lohr. 2016. Divergence in calls but not songs in the Orchard Oriole complex: Icterus spurius and I. fuertesi. Journal of Avian Biology 47: 109-120. Odom, K. J., K.E. Omland, and J. J. Price. 2015. Differentiating the evolution of female song and male-female duets in the New World blackbirds: can tropical natural history traits explain duets? Evolution 69: 839-847. Price, J. J., and M. D. Eaton. 2014. Reconstructing the evolution of sexual dichromatism: current color diversity does not reflect past rates of male and female change. Evolution 68: 2026-2037. Price, J. J., and C. L. Crawford. 2013. Use and characteristics of two singing modes in Pine Warblers. Wilson Journal of Ornithology 125: 552-561. Johnson, A. E., J. J. Price and S. Pruett-Jones. 2013. Different modes of evolution in males and females generate dichromatism in fairy-wrens (Maluridae). Ecology and Evolution 3: 3030-3046. Greig, E. I., J. J. Price and S. Pruett-Jones. 2013. Song evolution in Maluridae: both natural and sexual selection influence acoustic structure. Emu 113: 270-281. Price, J. J. 2013. Why is birdsong so repetitive? Signal detection and the evolution of avian singing modes. Behaviour 150: 995-1013. Naguib, M., and J. J. Price. 2013. The evolution of animal communication. Behaviour 150: 950-955.